A classic daffodil, like a classic car, has some history behind it. However, calling a daffodil a classic has as much to do with how it performs in the garden as it does with the year it was introduced. That's why my husband, Brent, and I refer to those that perform consistently and beautifully year after year as classics. Brent and I also consider daffodils (Narcissus spp. and cvs.) 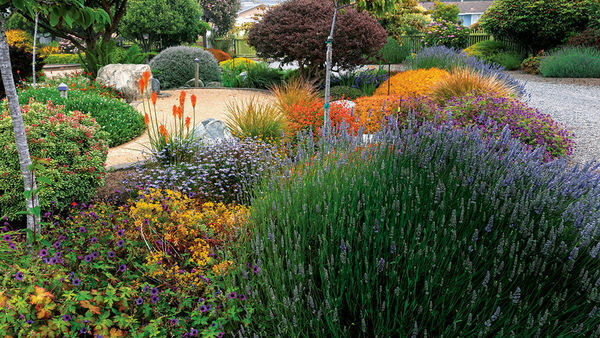 the perfect perennials. 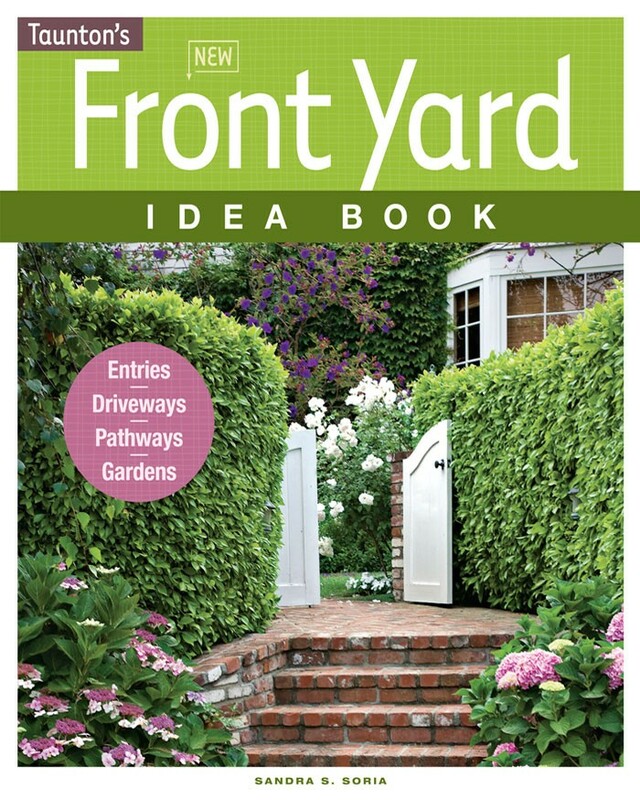 They emerge in spring when gardeners are eager to see a cheerful floral face. Deer and rodents rarely bother them. Most are hardy in USDA Hardiness Zones 3 to 9, and they prefer full sun. 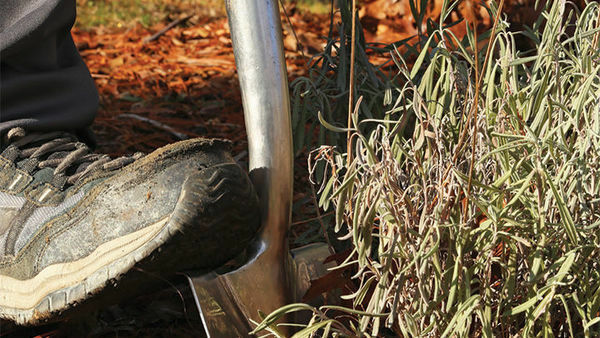 Daffodils tolerate different types of soil as long as it drains well and isn't too alkaline. 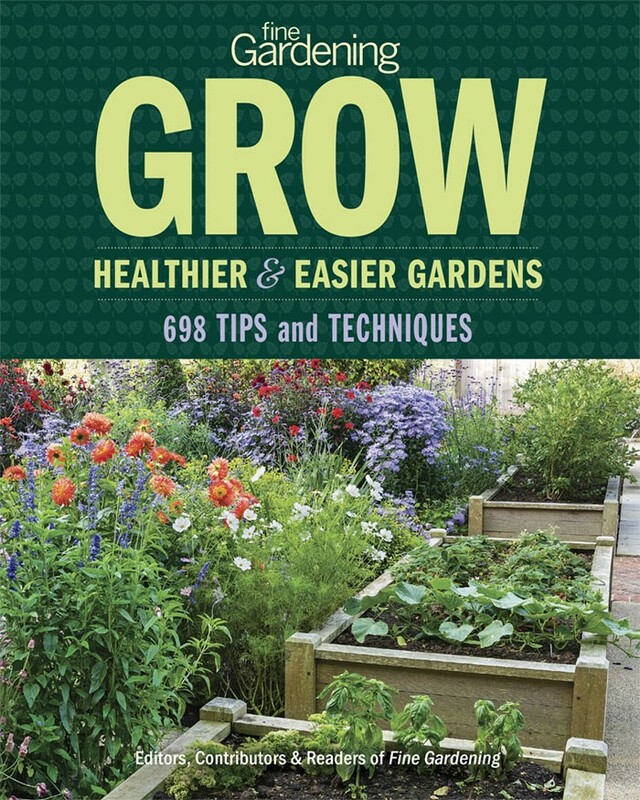 In other words, they're easy to grow. 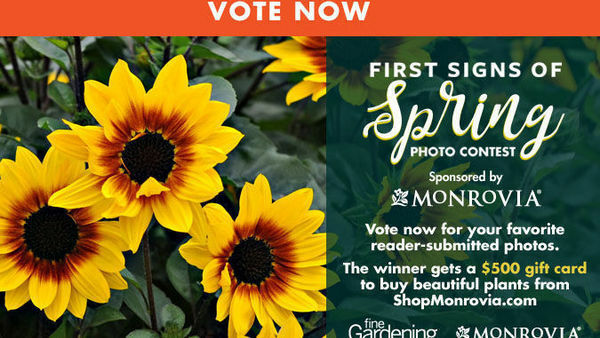 But since there are countless daffodils, with different flower shapes, varied bloom times, and flower colors in shades of yellow, white, orange, salmon, peach, and coral, how can you narrow down your choices? 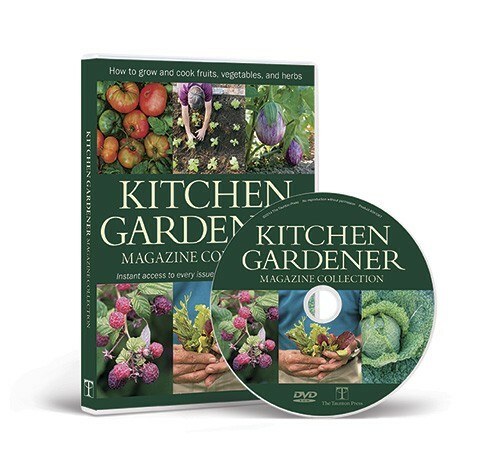 Why not consider one or two of what we call classics, those that have proven themselves and have become staples in our springtime garden. Narcissus ‘Rijnveld’s Early Sensation’ (1956, Zones 3–9), a classic yellow trumpet-type daffodil, is one of our favorites because it is the earliest-blooming daffodil on our farm. On New Year’s Day, we often have a bunch of just-picked blossoms sitting in a vase on our dinner table. During the rare years when we have snow cover, they emerge and bloom right at the edge of the melting snow. If we have a snowstorm after they bloom, they usually spring right back up when the sun comes out again. Because they bloom so early, they normally last longer than any other daffodil we grow, and they combine nicely with early crocuses and dwarf irises. The American-bred N. ‘Accent’ (1960, Zones 3–8) has white petals and a funnel-shaped, salmon-pink cup whose color stays true. Planting small blue flowers like Ipheion uniflorum ‘Wisley Blue’ or Muscari armeniacum around the ankles of ‘Accent’ creates a pleasing effect. This large-cupped daffodil has been growing in our garden for years, and we use it extensively in our hybridizing efforts. I refer to brightly colored flowers that can be seen from a distance at high speeds as 55 mph flowers. N. ‘Serola’ (1986, Zones 3–9) is just such a flower. 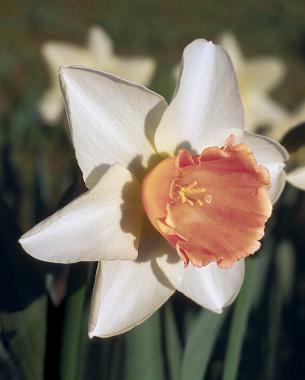 Although not classic as defined by its date of introduction, this large-cupped daffodil blooms reliably every year. 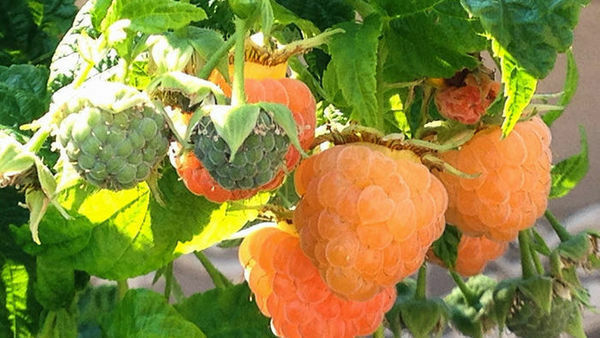 Its vivid yellow and orange color makes it the perfect choice for roadside plantings, for gardens viewed from a distance, and for hot-colored garden schemes. It shows up even better with contrasting colors like the bright, beet-red Hyacinthus orientalis ‘Woodstock’, or as a color echo with Tulipa ‘American Dream’. 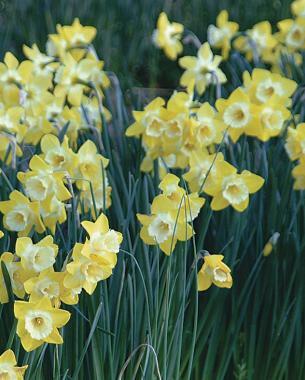 Jonquilla-type daffodils are on my list of favorites. 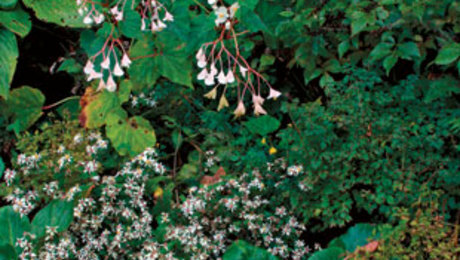 They produce dark-green, narrow, often reedlike leaves, which are relatively easy to hide in the border while they mature, and there is usually more than one sweetly fragrant flower per stem. 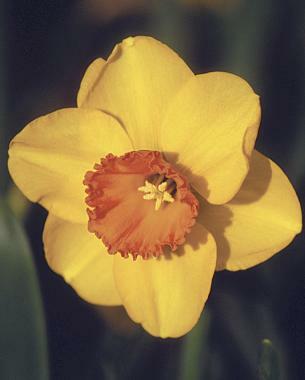 Probably the most fragrant of all, especially considering the size of the flowers, is N. ‘Baby Moon’ (1958, Zones 4–9), a precious, golden-yellow miniature daffodil that likes a summer baking. N. ‘Quail’ (1974, Zones 4–9) has similar characteristics but has a larger flower. Golden-yellow, sweetly fragrant, and a wonderful perennial, ‘Quail’ creates a special color echo with the golden center of the small tulip Tulipa bakeri ‘Lilac Wonder’. Triandrus-type daffodils usually have one or two nodding flowers per stem and are noted for their wonderful, often fruity, fragrance. 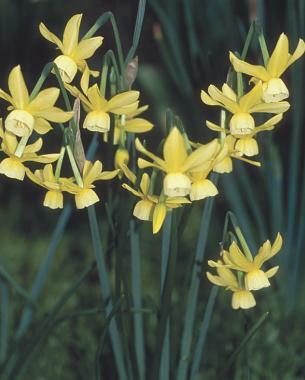 N. ‘Hawera’ (pre-1950, Zones 3–8) is a miniature triandrus-type daffodil with many elfin, pale-yellow nodding bells per stem, each with a demitasse-shaped cup surrounded by swept-back petals. 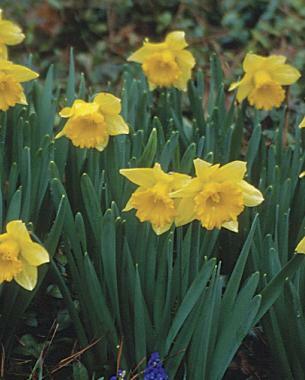 We have seen this adaptable daffodil growing in dry areas, in pots, in full sun, and in partial shade. It contrasts nicely with Muscari armeniacum and is exquisite with hellebores. Generally speaking, daffodils perform best in full sun and well-drained soil, in areas where there is a fair amount of rainfall in the fall and spring and where the summer is relatively dry. However, cyclamineus- type daffodils seem to tolerate at least partial shade and more moisture than others do. 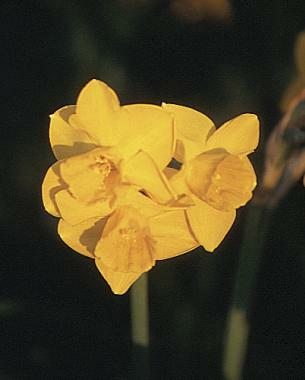 N. ‘Jack Snipe’ (pre-1951, Zones 3–8) is a charming example of this type of daffodil. Its white petals are swept back, as if it were standing in front of a fan, and its medium-length, buttercup-yellow trumpet (or nose) sticks straight out at a 90 degree angle from the stem. 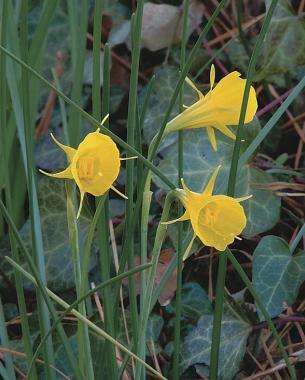 ‘Jack Snipe’ is an intermediate-size daffodil, standing only 8 to 10 inches tall, and is perfect for a rock garden or the front of a flower border. This little one was a favorite of my mother-in-law. 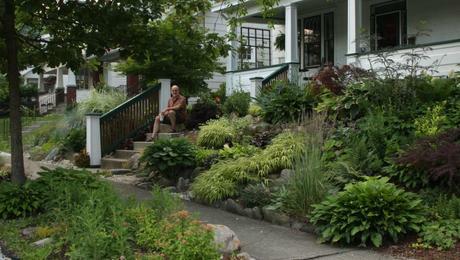 She had it coming up through lilyturf (Liriope muscari) on both sides of her sidewalk. This whole division of daffodils is becoming more popular not only because it tolerates some shade but also because the shape of the flower is so handsome. 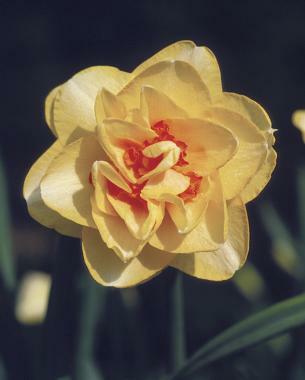 Although some people don’t consider double or peonylike daffodils classics, many double hybrids have been in existence for a long time. Our favorite double is N. ‘Tahiti’ (1956, Zones 3–8). The soft-yellow flower with bright reddish-orange interior ruffles is reminiscent of a blossom from the tropics. ‘Tahiti’ stands up straight under its own weight, even on windy days. 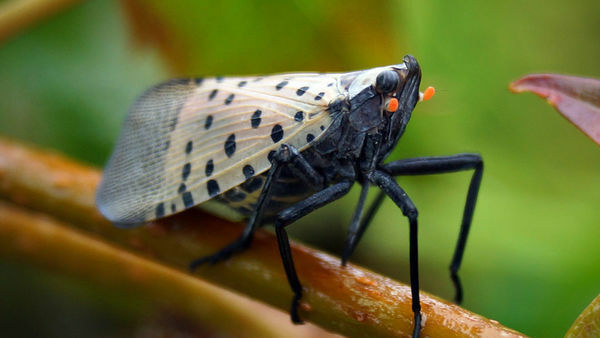 Its coloration is eye-catching, so it makes a big impact in the garden. Daffodils are organized into 12 divisions, based mainly on their flower forms. Division 1: Trumpet – cup as long as or longer than the petals. Division 2: Large-cupped – cup size from one third of to equal the length of the petals. Division 3: Small-cupped – cup size up to one third the length of the petals. 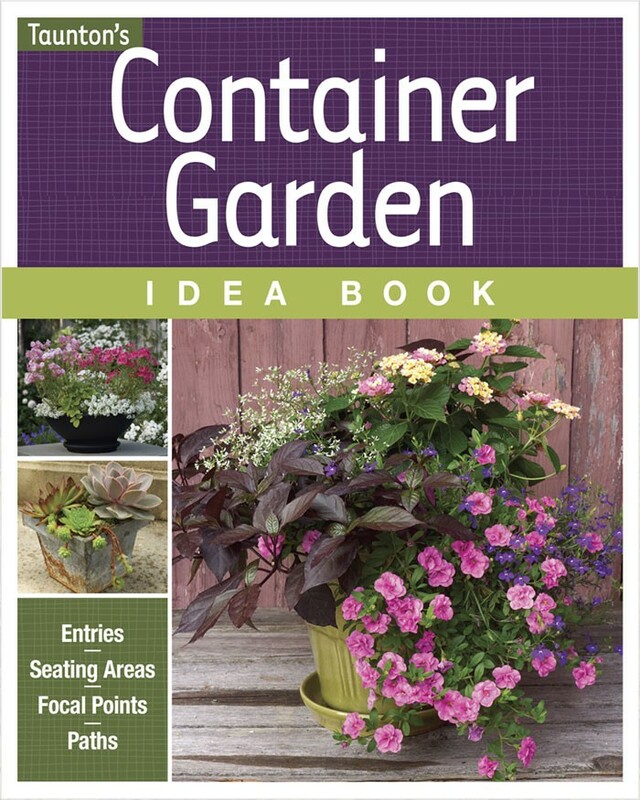 Division 4: Double – double the cups or petals on each flower. 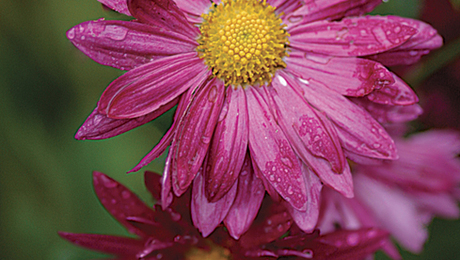 Division 5: Triandrus – swept-back petals, short cup, multiple nodding flowers per stem. Division 6: Cyclamineus – swept-back petals and a long cup; flower at a sharp angle to stem. 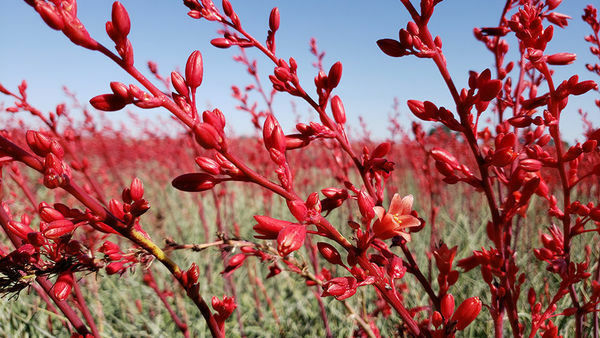 Division 7: Jonquilla – spreading petals and small cups; multiple flowers per stem; narrow leaves. Division 8: Tazetta – broad petals and small cups; multiple fragrant flowers per stem. Division 9: Poeticus – spreading white petals and small, red-rimmed fragrant cups. Division 10: Wild species – all wild daffodils and their hybrids. Division 11: Split-corona – spreading petals and cups split more than half their length. Division 12: Miscellaneous – those that apply to no other division. 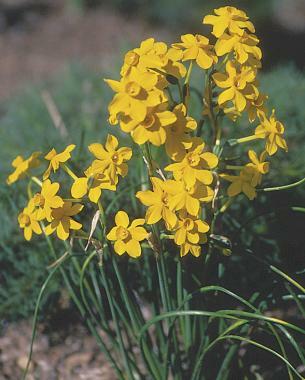 The species daffodil N. bulbocodium var. conspicuus (Zones 3–9) has been around so long that no one can actually put a date on it. Its look is unusual: It does have six golden petals, but they are tiny, twisted, and often difficult to see. Its prominent rounded cup gives rise to its nickname, hoop petticoats. It prefers acidic soil and when happy, will reseed, blooming like buttercups in groups. Only 4 to 6 inches tall, it naturalizes itself in our barnyard, under our tall pine trees, and in many other areas on our farm. Tazetta-type daffodils, including the paperwhites that can be forced into bloom indoors during the winter, are also fragrant. One of our favorites was also a favorite of Thomas Jefferson, although he probably knew it as N. ‘Seventeen Sisters’ (1700). It has been renamed N. ‘Avalanche’ (pre-1906, Zones 6–9) and is as popular today as it was in Colonial times. 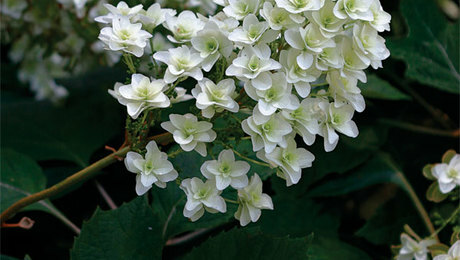 ‘Avalanche’ has a cluster of 10 to 20 tiny flowers, creating almost an entire bouquet on one stem. 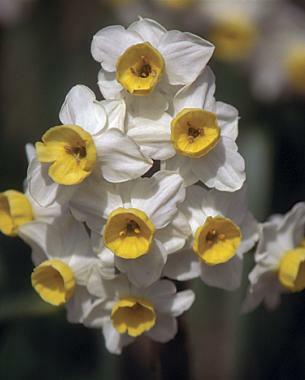 Its flowers, with white petals and pale-yellow cups, have a wonderful musky-sweet fragrance—a much better one, I think, than any paperwhite I’ve forced. 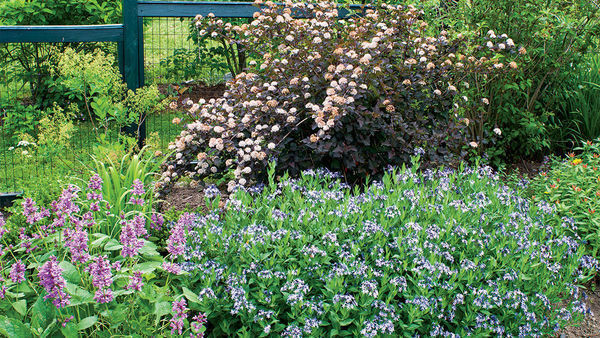 Since it is hardy to Zone 6, it can be enjoyed in many gardens. It shows off even more when combined with plants like Tulipa ‘Pink Impression’, Ornithogalum balansae, and pansies. 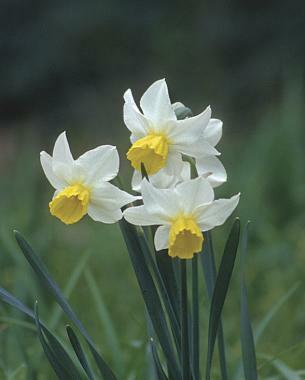 Narcissus are easy to grow, need no irrigation and beautiful harbingers of spring. 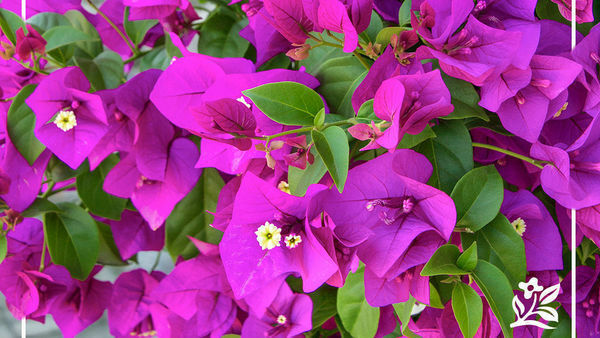 They are great for a Mediterranean climate like California or in any climate for that matter. 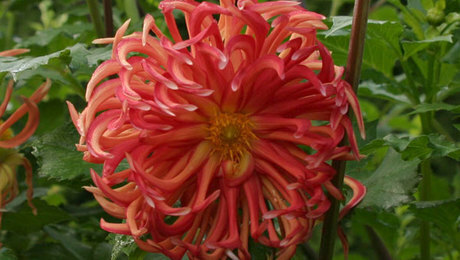 A wonderful diverse group of flowers that are only second to dahlias because dahlias bloom longer.